What are people saying about the upcoming device? Fitbit has already told us that it has multiple smartwatches in the pipeline, one of which, it believes, will have broader appeal than the Fitbit Ionic. We now know what that will look like, and some of the features it'll offer. While the Ionic was Fitbit's first admitted smartwatch, it also isn't selling too hot. This new smartwatch ditches the angular design born for the Blaze in favor of something more attractive and more Pebble-y. So what do people think? What are Fitbit fans, Pebble fans and analysts thinking about Fitbit's new entry for the mass appeal smartwatch crown? We took to the virtual streets of the internet to find out. The Ionic felt like Fitbit's big bet, a riposte to the Apple Watch. While some Fitbit users took to the device and are happy with it, a lot of other people didn't. Especially women. "The huge ugliness of the Ionic is what has kept me in my Charge 2, more so than the price," Fitbit user boomboomdolla said on Reddit. "The Ionic is just too overwhelming on a petite female with small wrists and hands. I really like the look of this watch from the pictures, it looks less imposing and more stylish (although it's hard to judge 100% without seeing it on)." While attractiveness is an issue for a lot of people, another big feature request is GPS. For some, the lack of GPS in the new watch is a dealbreaker, like grimacerock, who on Reddit said "no GPS makes this a hard pass for me." But others seem more willing to settle for Connected GPS as a trade-off for better design. Fitbit users are also hoping that Fitbit Pay and onboard storage for music makes its way to the new device. Some users aren't even interested in new Fitbit hardware, like Dinonino17, who instead wishes Fitbit users got extensive software updates every year rather than new devices. Especially since "the Ionic still feels incomplete with an app store that seems a beta testing." It's not hard to look at the new Fitbit smartwatch and think Pebble Time 2. Sources did tell us that Pebble had a touchscreen smartwatch in development that wasn't dissimilar. Fitbit is also in control of Pebble's SDK, which it has co-opted to launch its App Gallery. So how is the Pebble community reacting to a new Fitbit smartwatch that looks like a Pebble, using a Pebble SDK for an app store? In sum: cautiously optimistic, but looking for some assurances. "Always on screen? At least 7 days battery? Notifications? Then yes my friends at Fitbit, you have a returning customer," says Pebble user GeetFai on Reddit. Other Pebble users issued similar sentiments, saying they'd consider it if Fitbit better continued the legacy of Pebble devices. "This probably explains why Fitbit extended the life of Pebble's servers," says mjhumphrey. "The Ionic has pretty much been a flop, and hasn't enticed many Pebble owners. I expect this device will be launched before the end of June, and Fitbit is going to try to sweet talk us Pebble owners into buying it as a direct replacement. I hope they get the functionality right, and make the discount for Pebble owners enticing!" Others, however, were more pessimistic, saying it still looked a little too chunky. "My wife has a [ Pebble Time Round] and it blows my mind that it's still the thinnest smartwatch on the market," said scottzee on Reddit. "While this design is better than the Fitbit Ironic [SIC], she definitely won't be interested with it being that thick." Definitely an improvement on the @Fitbit Ironic, but I think this is still to chunky to appeal to women. Make a round, thin one like the Pebble Time Round. This one may appeal to a lot of men, though. Some Pebblers showed their frustration with Fitbit so far, but are willing to give the company one more try at winning them over. What does a "mass appeal" smartwatch actually mean though? Over on Twitter, Stuart Brierley, an Ionic user, is hoping the new device sells to enough customers to spur development for Fitbit OS, which in turn would make the Ionic experience better. Similar sentiments were shared by software developer Turner Vink, who is interested by Fitbit's development platform but has yet to jump aboard. If this is true, it really does look like a Fitbit variation of the Pebble Time 2. I have an Ionic, so would be good if the Fitbit OS does make it on more wrists to drive adoption and app development. The difficult part for Fitbit is actually turning the new smartwatch into a mass-market success. Jackson Somes, industry analyst for Gap Intelligence, says that Fitbit may be too far behind its competitors at this point. "I think this was a very necessary move for Fitbit, but it also calls into question if this too little too late for Fitbit," he tells Wareable. "We already know Apple is eating Fitbit's lunch here. As more consumers adopt smartwatches from different brands and move away from fitness trackers Fitbit is losing more and more that core market." Somes says he expects a price point around $199, but that has the potential of undercutting Fitbit's message as a company. Fitbit, he says, wants to position itself as the ultimate health and fitness consumer software platform. "When you transition that platform to a mass-market product it kind of sends a mixed message, basically. So here's an affordable model of what we say is the best you can buy." Consumers, Somes argues, are already trained to think that affordable products are lacking in some way. Consumers aren't paying as much for something because it's not the best. "What made Fitbit [a success] early on is, number one, the lack of direct competition because they were one of the founders of the wearable market, but also having achievable price points for mainstream consumers," Somes says. "But when you look at the release of the Ionic those two factors were no longer true." 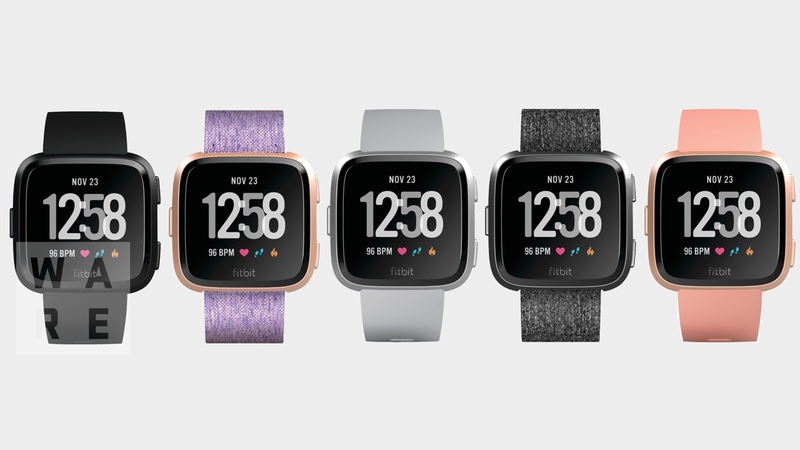 Those two factors will have to be true for the new mass appeal smartwatch, and Somes thinks the only real chance Fitbit has of winning back some marketshare against the Apple Watch juggernaut is if Apple doesn't release a Series 4 this year. Hello, dear Wareable reader. There were some interesting thoughts in the Wareable comment thread on the story too, including Pw1 who said: "Please do an Android Wear version with all [their] health apps." Commenter Darcer had a more specific critique: "Why does Fitbit insist on having their logo on the front? Just remove that, make the bottom bezel thinner, and it would look a thousand times better." Meanwhile commenter Sparks is hopeful of a couple other features: "They look heck of a lot better. Funny how long it took them to realize what a decent design is. Hope it's a standard watch band size such as 22[mm] and def need to be able to reply to messages. Looks sorta what the Pebble's new Time 2 would have looked like." Then there's datalore: "I like the design, but, of course, taste is subjective. I hope Fitbit can survive if for no other reason than to be an alternative to the Apple/Google duopoly."